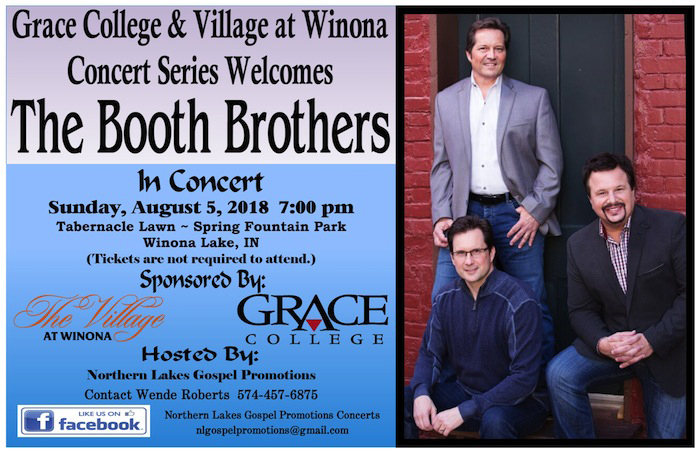 WINONA LAKE — Northern Lakes Gospel Promotions will host a concert, featuring the Booth Brothers, at 7 p.m. Sunday, Aug. 5, on Tabernacle Lawn in Spring Fountain Park, 700 Park Ave., Winona Lake. The concert is part of the Grace College and Village at Winona summer concert series. The concert is free, but a love offering will be taken to benefit North Webster-based Northern Lakes Gospel Promotions. “The concert ministry’s desire is to bring Christian artists into Kosciusko County so the good news of the gospel may be shared,” said Wende Roberts, president of the promotion group. The trio, comprised of Ronnie and Michael Booth and Paul Lancaster, presents gospel music with harmony-drenched vocals and warm, easy voices. The group has garnered numerous industry honors, including album, song, trio and favorite artist of the year awards. The Booth Brothers have a unique ability to communicate through song and humor. They appreciate the opportunity to meet their friends and fans at their concerts and other special events. Seating under the tent will begin at 5:45 p.m. with a beginning announcement at 6:45 p.m. Approximately 350 chairs will be set up and are available on a first-come, first-served basis. Attendees may also bring their own chairs or blankets.